While I’m not an avid fan of dramas (because I don’t have the patience to watch every single episode and wait for the ending), here are some movies which I’ve watched and loved. The first K-drama which I’ve watched till the end (without giving up) was Rooftop Prince. The main reason why I watched this was because there was Yoochun starring in it, and I’ve heard about it’s popularity in Korea. The teasers seemed promising too, so I watched it and fell in love with the characters! This drama starts off light-hearted, but the only flaw about it is the ending! *Spoiler Alert* In the last episode, the Prince vanished and went back to the Joseon era, but I couldn’t figure out who was the guy who met with Park Ha (in the current era)… Lee Gak (the Prince) or Yong Tae Yong (the current version of Lee Gak)? Another K-drama that attracted me was God’s Gift 14 Days. I didn’t expect myself to end up watching this, but I read a synopsis of this drama in a news column and I thought it sounded pretty exciting to me. It’s basically about a mother going back 14 days in time to save her daughter, but firstly she has to find out who’s the murderer within that short amount of time. The entire drama is really fast-paced, leaving you wanting for more. I watched 3 to 4 episodes of this drama each time, because I got really excited and curious to know who will be the murderer. And it just so happens that they always end an episode at the exciting part. So you’ve gotta click on the next episode to find out what happens next at the exciting part. Nevertheless, I think K-dramas always have this problem. When a drama is too good, the directors always end it with a cliff-hanger – so that you will wonder what will happen to the characters next (and the director will produce a Season 2 to earn more profit) – or an ending “up-to-you” to interpret – so that everyone can have the ending he/she wants. *Spoiler alert again* The last episode of this drama ended so abruptly without telling you what happened to the male lead in the end. Did he commit suicide to prevent himself from killing the girl (he did it by accident – he threw her into the sea when he was drunk because he thought it was his brother who killed her and wanted to hide it for him, but the girl was in unconscious state after being drugged, not dead yet), or did he save the girl (when she grabbed on his sleeve) and live too…? No one knows the answer… whether he lived or not. But I was hoping for a happy ending (since there was a mysterious hand on his mother’s shoulder when the family went to fetch his brother back from prison). But overall, it was a good drama, really thrilling and I enjoyed it. The scriptwriter must have been a really smart fella – the clues and mysteries in this drama were quite difficult to solve, but once you get it, you’ll be like “wow that’s a really cool one”. 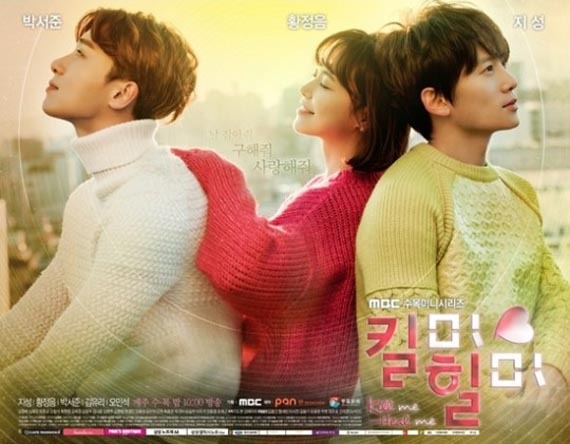 Last but not least, Kill Me Heal Me! I’m currently going crazy over this drama because Jisung’s acting is so good. There are many ad-libs in this drama too, and this makes the characters even more outstanding. I hope the ending will be one that is satisfactory though!